Part love letter and part memoir, el Khalil's work employs her artist's eye and ear to depict Beirut during and after the Israeli attacks on the country's south and the Lebanese civil war. No simple chronological narration, this is rather a highly personal, impressionistic depiction of events and emotions: "There is a thin line between reality and dream," she writes. 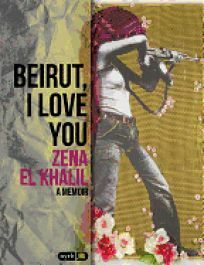 But she also has a sharp eye for the cruel absurdity of life in Lebanon ("We were well known for our hospitality. Prostitutes, militiamen, corrupt politicians, puritanical evangelists, poets, artists, nihilists, dreamers, writers, jihadists, businessmen—all were welcome"). But this hospitality and cosmopolitanism are gone, and the Lebanese are now trying, but unable, to forget the devastation of war and the failures of the government to provide basic necessities, which awakened people's faith in militias. El Khalil bitterly recounts the devastation wrought in the 1970s by Israel's attacks on the PLO in southern Lebanon, and the occupation, when an Israeli prison and bunkers were built over her grandfather's home. The author's varying tones of passion and detachment heighten the emotional effect. Like Baghdad, which has somehow always survived, el-Khalil defies defeat. Her unflinching inside view of Beirut's tragedy and of "Amreekan" duplicity underscore why her 2006 blog beirutupdate.blogspot.com received international attention. (Oct.).